Vlad Tepes or also known as Vlad the Impaler is a legendary story. The country where Dracula resided in derived its name from the geographic position beyond the Carpathian Mountains, which are full of dense forestation. Early travelers to the region described the country as "trans-silva" which means "over-forest" in Latin. The region"s proximity to the Black Sea means that it is very vulnerable to invasion from the Ottoman Turks" to the southeast and the Tatar"s Golden Horde on the northeast. If the infidels gained control of the region, they could have free access to central Europe; making it a region of great political significance. Vlad Tepes was born in either November or December of the year 1431 in the fortress of Sighisoara, Romania. 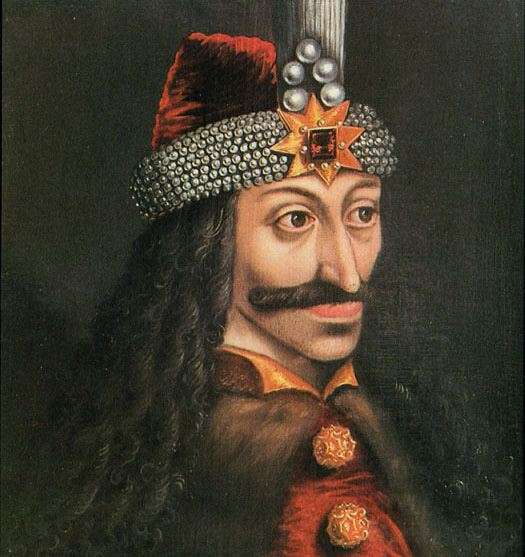 Vlad Dracul, the father of Vlad Tepes, was the military governor of Transylvania. Appointed by the emperor Sigismund who had been initiated into the Order of the Dragon roughly a year before. The Order of the Dragon, a semi-military and religious society, was created by the Holy Roman Emperor and his second wife Barbara Cilli in 1387. These knights had one main goal, and that was to protect the interests of Catholicism and to crusade against the Turks. This is important to Dracula"s history because Vlad Dracul received the name "Dracul" means "Dragon or Devil" in the Romanian Language. "Dracula" means "son of the Dragon or the Devil." The Order of the Dragon also had official attire consisting of a black cape over a red garment which is said to be worn only on Fridays or during the commemoration of Christ"s Passion. Between 1436 and 1437 Dracul became the prince of Wallachia which was one of the three Romanian provinces. Dracul resided in the palace of Tirgoviste. Vlad Tepes lived for six years at this location until he and his younger brother Radu were taken hostages by Sultan Murad II. Dracula stayed here in Turkey until 1448 while Radu stayed until 1462. The Turks set Dracula free after Dracul, Vlad Dracul, was assassinated in 1447. The assassination was organized by Vladislav II. Mircea, Dracul"s eldest son and older brother to Dracula had also been tortured to death by the boyars of Tirgoviste. Mircea was buried alive after being blinded by red-hot irons. It is said that it is during this time that Dracula started to feel little remorse for the loss of life by torture or any other means of death and studied the Turks art of torture. It was also written that it was much better for a prince to be feared than to be loved. At the not so tender age of 17, Mustafa Hassan lent a small army of Turkish cavalry and troops to Dracula which he then used to seize the throne of Wallachia. However, Vladislav II reclaimed the throne from Dracula two months after. Dracula, barely 25 at this time, finally claimed victory over his father"s assassin and his mortal enemy in July 1456. Dracula had his longest reign of terror at this time, 6 years, in which he molded his terrible and cruel reputation. He assumed the throne under the passing of an ominous comet which marked a bad future for his reign. Dracula set his rage on the boyars who were responsible for his father and brothers" deaths. On Easter Sunday of what is said to be 1459, Dracula commanded a great feast where he impaled all of the older members of the boyar families and forced the survivors to march with no rest to Poenari which was 50 miles long. Those who survived this test were then forced to build a fortress later referred to as Castle Dracula. Dracula used some of the most grotesque torture techniques known. He often had people skinned, boiled, decapitated, blinded, strangled, hanged, burned, roasted, hacked, nailed, buried alive, stabbed plus many others. He also liked to dismember people by cutting off noses, ears, sexual organs, and limbs. His favorite method of torture was impalement. "Tepes" actually means "The Impaler" in the Romanian language. He used any crime such as lying, stealing and killing as excuses to impale someone. To prove his methods would create a better society, Dracula placed a golden cup in his town square which would be used to quench the thirst of travelers but may never be stolen. The cup remained here always refilled but never stolen in all of Dracula"s reign. Dracula considered the poor and sick as bad as thieves/killers. It is said that Dracula invited all of the people that fit this unfortunate category to a great feast. Shortly after the great feast was over, Dracula ordered the entire hall to be boarded up and set on fire immediately. No one survived. In the early months of 1462, Vlad led a quite risky campaign against the Turks, led by Sultan Mehmed II whose forces outnumbered Vlad"s troops tremendously. Vlad managed by impossible odds to secure many victories by the winter of 1462. Outraged by this, the Sultan decided to send out all of his troops, an army approximately three times the size of Dracula"s, to finally gain control of Walachia and claim it as a Turkish province. Vlad by this time had no alliances, so he simply retreated to Tirgoviste. However, this was not before he burned his own villages and poisoned the wells in hopes of starving his enemy and maybe even poisoning some with the wells" water. When Sultan Mehmed II finally reached Dracula"s stronghold, he found that the 20,000 Turkish troops that Dracula had captured were now impaled on stakes, which was later given the name "The Forest of the Impaled." This horrific feat was the turning point of this battle. The Sultan and his army then proclaimed defeat and dropped the battle. This is when Dracula"s own brother Radu took upon him a Turkish army which he then allied himself with Dracula"s rivals and pursued Vlad Tepes to Poenari Castle along the Arges River. In legend, this is when it is said that Dracula"s wife committed suicide by throwing herself into the river. Vlad used a secret passage located in the fortress which deposited him into the mountain region to escape and exact his revenge at a later time. Helped by some peasants, Vlad fled to Transylvania to meet the new king of Hungary, Matthias Corvinus. To Dracula"s amazement and horrible shock, he was imprisoned by the new king. Dracula escaped sometime in 1475 and gained control of Walachia for a third and final time. Supposedly in December 1476, Dracula was assassinated and his head was cut off and sent to the Sultan of Constantinople. However, due to various other accounts of the precise time of Dracula"s death and the fact that his body was never found gave way to myths of his existence. I was told that he was buried at Snagov. During Dracula"s reign, he is said to have impaled between 40,000 to 100,000 victims. He is also still revered as a hero in Romania today mainly for his resistance to the Turks. Vlad Tepes aka Vlad the Impaler (Count Dracula) serial killer is a male serial killer. Vlad the Impaler, Count Dracula, Draculea is a male serial killer.